The Independent Filmmakers Showcase has announced that “Lives Interrupted: The Takuma Ito and Go Matsuura Story” has been named the best documentary film in the IFS Film Festival 2013 Awards. In a scene from “Lives Interrupted,” mourners gather at a shrine put up in the parking lot where Takuma Ito and Go Matsuura were shot. A screening of the film will be held at 6:45 p.m. on Wednesday, March 27, with the red carpet and award ceremony held at 6:30 p.m. on Thursday, March 28, at Laemmle’s Music Hall Cinema, 9036 Wilshire Blvd. in Beverly Hills. 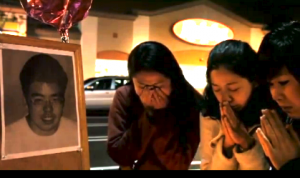 Written and directed by Professor Bruce Schwartz of Marymount College , this documentary reflects on the shooting of two Marymount film students from Japan who were gunned down during a carjacking in San Pedro in 1994. Schwartz interviewed the friends, colleagues and families of Ito and Matsuura, both in the U.S. and Japan, to set their shortened lives into perspective and analyze societal violence. The murders became headline news in Japan, prompting apologies from President Clinton and U.S. Ambassador Walter Mondale. The gunman, Raymond Oscar Butler, was sentenced to death but remains in jail and has since been convicted of murdering a fellow inmate. The Ito/Matsuura Film Series, held annually by the college, honors the aspiring filmmakers’ memories by screening the best in independent cinema. The Independent Filmmakers Showcase is an organization founded to promote and support the creation and distribution of quality independent filmmaking. “Lives Interrupted,” which premiered last October at the Warner Grand Theatre in San Pedro with Ito’s father and brother in attendance, has also received a congressional letter of commendation from Rep. Janice Hahn. For more information on the film festival, which runs through April 8 and features a retrospective of Japanese director Nobu Yamaoka, visit www.ifsfilm.org. For more information on “Lives Interrupted,” visit www.takandgo.com.